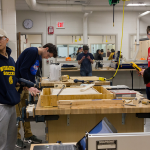 The first week of build season is quite the ride for any robotics team–rookies learning their way around the shop, veterans trying to remember how things work, and media trying their hardest to get someone–literally anyone–in front of the camera. It’s overwhelming, to say the least. But amidst the confusion and worry, there is something very important forming. 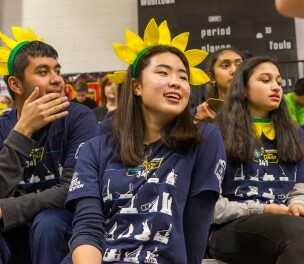 The morale that arises in week 1 sets the tone for the entirety of build and competition season. 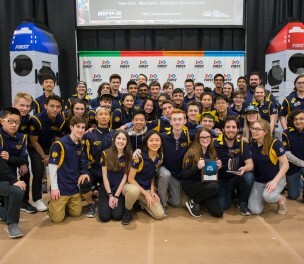 It puts forth a mindset that must be positive and willing to take risks for great rewards, and with a fresh group of minds and hands to help, it’s time to get busy with creating this year’s robot. But first: prototyping. The five subgroups of the design and build team (drivebase, habitat, game piece score, hatch intake, and cargo intake) are prototyping the first designs of their subsystems, and it all starts with a whiteboard. Drawing out their ideas and discussing the pros and cons of each, the subsystems have gone through an extensive brainstorming process to establish their first prototype design. 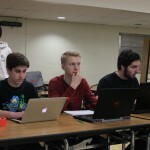 Afterwards, they began working within their groups to create a variety of prototypes. At Saturday’s status meeting, groups introduced prototypes for their cargo intakes, hatch intakes, and even a prototype of a cascading elevator. These status meetings are pertinent to the team’s understanding of different subsystems’ development, and ensuring that everyone has the chance to put in their two cents on each design. In the afternoon, subsystems had the chance to test their prototypes on team-made field parts. 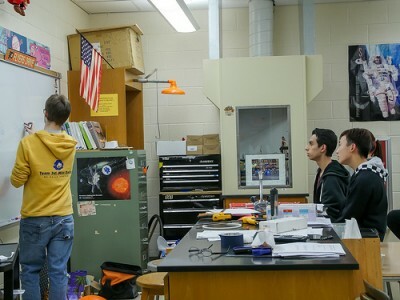 The programming sub-team is also working hard to develop a plan for robot vision. 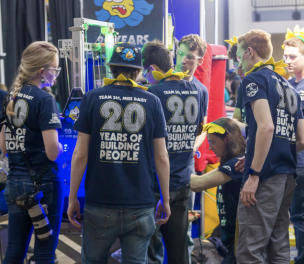 With the new sandstorm period, our drive team needs to know what is going on during the first 15 fifteen seconds of each match. In addition to this, Rev Robotics recently released the JAVA API for Spark Max Motors. In plain English, the instructions for a motor are now available to program, which is pretty important. Through trial and error, the programmers have been collaborating to develop the best plan for various functions. As it turns out, the dark cave of a computer lab we now have actually fosters some pretty interesting ideas. Soon, the programming sub-team will be collaborating more and more with the design and build team to integrate their work with one another. Until then, they’re banished to the cave. As for some problems we’ve run into, it is always difficult to start up such a rigorous schedule again. 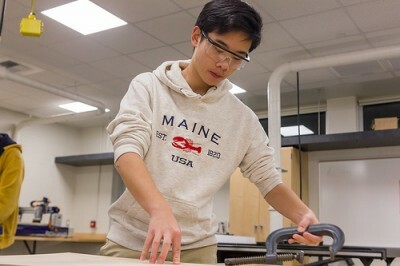 But with the new fabrication lab, the team is slowly establishing a routine. With great space comes great responsibility, and also a greater space to clean up, which has become a very time consuming portion of the day. Even so, rookies, veterans, and coaches alike are grasping the new rules and becoming more and more efficient in our work spaces. The problems we’ve run into are minuscule compared to the successes we’ve had this week. When the sanding machine isn’t working and you’re forced to hand-sand pieces of wood, or a media kid keeps bugging you for an interview, it’s important to remember that your work will eventually amount to something much bigger than yourself. Well, hopefully. Who knows, maybe we’ll build a Roomba sized robot–that would really catch our competition off guard. Kickoff 2019: Did the Water Game Prevail?